I recently read an interesting paper about codon bias at structurally important sites that sent me on a small detour from my usual activities. Tong Zhou, Mason Weems and Claus Wilke, described how translationally optimal codons are associated with structurally important sites in proteins, such as the protein core (Zhou et al. MBE 2009). This work is a continuation of the work from this same lab on what constraints protein evolution. I have written here before a short review of the literature on the subject. As a reminder, it was observed that the expression level is the strongest constraint on a protein's rate of change with highly expressed genes coding for proteins that diverge slower than lowly expressed ones (Drummond et al. MBE 2006). It is currently believed that selection against translation errors is the main driving force restricting this rate of change (Drummond et al. PNAS 2005,Drummond et al. Cell 2008). It has been previously shown that translation rates are introduced, on average, at an order of about 1 to 5 per 10000 codons and that different codons can differ in their error rates by 4 to 9 fold, influenced by translational properties like the availability of their tRNAs (Kramer et al. RNA 2007). Given this background of information what Zhou and colleagues set out to do, was test if codons that are associated with highly expressed genes tend to be over-represented at structurally important sites. The idea being that such codons, defined as "optimal codons" are less error prone and therefore should be avoided at positions that, when miss-translated, could destabilize proteins. In this work they defined a measure of codon optimality as the odds ratio of codon usage between highly and lowly expressed genes. Without going into many details they showed, in different ways and for different species, that indeed, codon optimality is correlated with the odds of being at a structurally important site. I decided to test if I could also see a significant association between codon optimality and sites of post-translational modifications. I defined a window of plus or minus 2 amino-acids surrounding a phosphorylation site (of S. cerevisiae) as associated with post-translational modification. The rationale would be that selection for translational robustness could constraint codon usage near a phosphorylation site when compared with other Serine or Threonine sites. For simplification I mostly ignored tyrosine phosphorylation that in S. cerevisiae is a very small fraction of the total phosphorylation observed to date . For each codon I calculated its over representation at these phosphorylation windows compared to similar windows around all other S/T sites and plotted this value against the log of the codon optimality score calculated by Zhou and colleagues. At first impression it would appear that there is a significant correlation between codon optimality and phosphorylation sites. However, as I will try to describe below this is mostly due to differences in gene expression. Given the relatively small number of phosphorylation sites per protein, it is hard to test this association for each protein independently as it was done by Zhou and colleagues for the structurally important sites. The alternative is therefore to try to take into account the differences in gene expression. I first checked if phosphorylated proteins tend to be coded by highly expressed genes. I figure 2 I plot the distribution of gene expression for phosphorylated and non-phosphorylated proteins. There is only a very small difference observed with phosphoproteins having a marginally higher median gene expression when compared to other proteins. However this difference is small and a KS test does not rule out that they are drawn from the same distribution. The next possible expression related explanation for the observed correlation would be that highly expressed genes tend to have more phosphorylation sites. 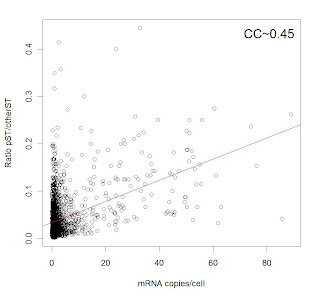 Although there is no significant correlation between the gene expression level and the absolute number of phosphorylation sites, what I observed was that highly expressed proteins tend to be smaller in size. This means that there is a significant positive correlation between the fraction of phosphorylated Serine and Threonine sites and gene expression. Unfortunately, I believe this correlation explains the result observed in figure 1. In order to properly control for this observation I calculated the correlation observed in figure 1 randomizing the phosphorylation sites within each phosphoprotein. To compare I also randomized the phosphorylation sites keeping the total number of phosphorylation sites fixed but not restricting the number of phosphorylation sites within each specific phosphoprotein. 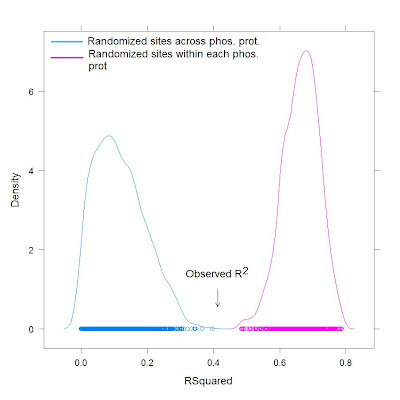 When randomizing the phosphorylation sites within each phosphoprotein, keeping the number of phosphorylation sites in each specific phosphoproteins constant the average R-squared is higher than the observed with the experimentally determined phosphorylation sites (pink curve). This would mean that the correlation observed in figure 1 is not due to functional constraints acting on the phosphorylation sites but instead is probably due to the correlation observed in figure 3 between the expression level and the fraction of phosphorylated S/T residues. The observed correlation would appear to be significantly higher than random if we allow the random phosphorylation sites to be drawn from any phosphoprotein without constraining the number of phosphorylation sites in each specific protein (blue curve). I added this because I thought it was an striking example of how a relatively subtle change in assumptions can change the significance of a score. I also tested if conserved phosphorylation sites tend to be coded by optimal codons when compared with non-conserved phosphorylation sites. For each phosphorylation site I summed over the codon optimality in a window around the site and compared the distribution of this sum for phosphorylation sites that are conserved in zero, one or more than one species. The conservation was defined based on an alignment window of +/- 10AAs of S. cerevisiae proteins against orthologs in C. albicans, S. pombe, D. melanogaster and H. sapiens. 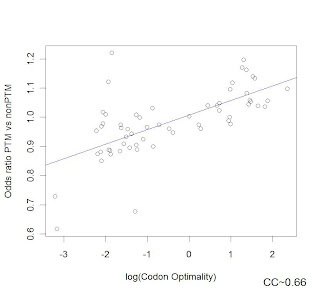 I observe a higher sum of codon optimality for conserved phosphorylation sites (fig 5A) but this difference is not maintained if the codon optimality score of each peptide is normalized by the expression level of the source protein (fig 5B). In summary, when the gene expression levels are taken into account, it does not appear to be an association between translationally optimal codons with the region around phosphorylation sites. This is consistent with the weak functional constraints observed by in analysis performed by Landry and colleagues.